With its vaulted ceilings, horseshoe counters and classic seafood menu, the Grand Central Oyster Bar has certainly earned its place as the quintessential oyster restaurant in the city, where you can sip, slurp and watch the bustling crowds until the last train home. It’s a must-see for every ostreaphile, so join us at this most elegant of New York’s culinary landmarks. 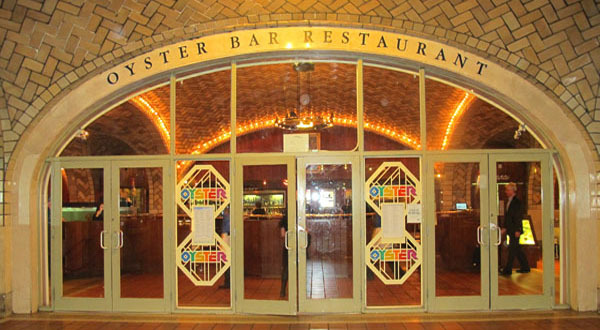 We’ll be meeting for dinner on Monday, March 25 at 6:30 pm at the Oyster Bar, located inside the train terminal at 89 E. 42nd St (and Vanderbilt). Executive Chef Sandy Ingber has created the following menu for our group and it promises to be an exciting time. Plus, Grand Central Terminal is currently celebrating their centennial anniversary, so be sure to take a peek at the historical exhibits and art installations in Vanderbilt Hall. The price for this dinner is $50 plus tax and tip. If you order any drinks or other menu items a la carte, please settle those with the server on your own. Our group is capped at 18, but if there is enough demand, we may be able to get more spots. Note: refunds will not be issued for this event, so please be confident that you can make it.